This NAACP case seeks to empower the districts where prisoners are from and most likely to return. The “ruling is a step towards securing that constitutional right for the people of Connecticut, in a case that will matter for all states that continue to engage in this unconstitutional practice,” said NAACP General Counsel Bradford M. Berry. The case will now proceed to discovery and potentially to trial. 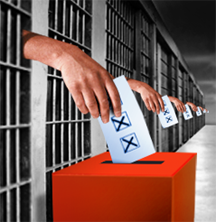 The complaint alleges that prison gerrymandering violates Connecticut residents’ constitutional rights to one person, one vote by inflating the power of predominantly White rural districts, where many prisons are located, to the detriment of urban districts, where many incarcerated persons maintain a permanent residence. “Prison gerrymandering is a double punch, it takes away the political power of people of color and gives it to rural districts,” said Scot X. Esdaile, President of the NAACP Connecticut State Conference. “Not only are our communities devastated by mass incarceration, but this practice piles on by taking political equality away as well,” he continued. The plaintiffs seek to compel Connecticut to adopt a new redistricting map that counts incarcerated individuals in their home state legislative districts rather than in the districts where they are incarcerated.